Ugandan officials say documents Israel provides for illegal infiltrators to move to Uganda are fake. 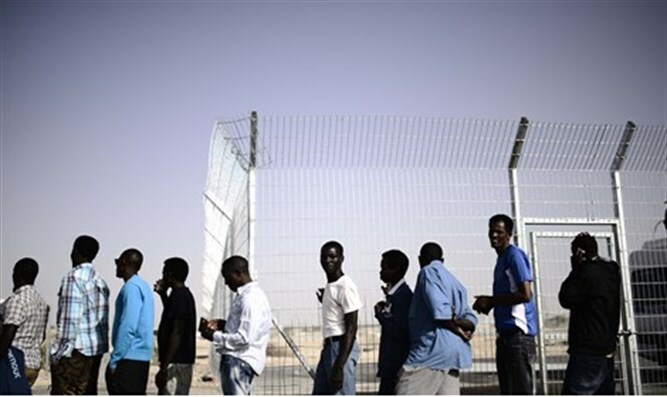 The visas given to illegal infiltrators on behalf of the Ugandan government are fake, according to a report by Haaretz. The visa documents were presented by the State to the Supreme Court as proof that third countries have agreed to accept the infiltrators from Israel. According to the Population and Immigration Authority, the visas were issued by the Ugandan government, and given by Israel because Uganda does not have an official representative in the Jewish State. The document given in Israel states that an official visa would be given to the infiltrators upon their arrival in Uganda, along with an identity card. Ugandan officials told Haaretz that the document, which is not signed by any official and contains only a blurry electronic signature, is a complete fake. “No one wrote this document, it’s fake, totally fake,” said Robert Kanuma, the head immigration officer at Entebbe Airport. “It is not true that every asylum seeker receives a visa and an ID card when he arrives,” a source in the Office of the President of Uganda told Haaretz. “Uganda has an electronic border management system where visitors can apply for a visa and present the relevant documents at any entry point. None of that happened in this case." The State has until noon on Sunday to present the Supreme Court with a finalized plan for the deportation of the illegal infiltrators.